Beer Board Chairman Jim Bush introduced a measure allowing Sunday beer sales. 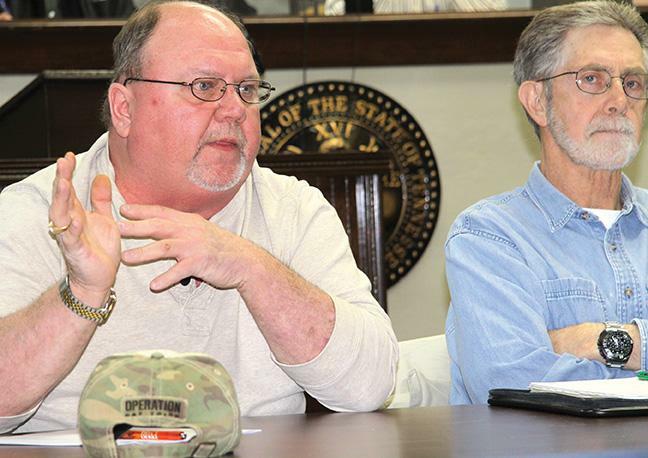 Discussion over beer sales on Sunday became sharply divided as County Commissioners delved into the ramifications of the August vote to allow liquor by the drink in Cannon County. The citizens of Cannon County voted in favor of allowing liquor by the drink during August's General Election. While, no one has applied for a license yet, it is believed at least one restaurant will soon make that move to seek permission from the Tennessee Alcoholic Beverage Commission (ABC). Rob Womack of Parsley's Market attended the Thursday night (Feb. 5) meeting with a request. "We've been here several times to try to get Sunday beer sales," Womack told the Commission. "Things have changed. The people have voted for Sunday alcohol sales." New businesses will be coming soon in that feature Sunday beer and alcohol sales, he continued. The county needs to act immediately to allow existing Cannon County businesses to sell beer on Sunday. "Because of that referendum, its gonna take action from this board to allow sale of beer on Sunday," said Womack, who added that his information came from the ABC. "Rob, are you sure that businesses outside the town of Woodbury will be allowed to sell liquor by the drink," asked Commissioner Mark Barker. "If someone decided to put a restaurant across that lot from you, would they be allowed to serve alcohol on any day of the week?" Womack said, "from mine own knowledge" that will soon be possible. "That would put us at a distinct competitive disadvantage." County Executive Mike Gannon said currently the issue is very unclear. "It's a complicated mess." However, both CTAS and MTAS are both researching the situation for Cannon County and Woodbury, he said. CTAS is the County Technical Advisory Service and MTAS is a comparable organization for city governments in Tennessee. "CTAS seems to have the opinion that whether or not you sell it on Sunday will be up to the ABC, but I don't know yet. I will have to get back with them," Gannon said. However, earlier during the meeting, the Commission came down against Sunday beer sales. That 5 to 3 vote was preceded by a short statement from Ralph Harvey, owner of Short Mountain Market. Harvey was there to request a revision of the county's 900-foot policy. Henry's market is 700 feet away from Short Mountain Church of God at 6621 Short Mountain Road. Harvey said his December and January sales were the worst in 31/2 years. Gasoline sales were down $30,000 in January. "Our revenues are going to two other counties," he said. Commissioner (and beer board chairman) Jim Bush said he didn't favor the change. "It's a slippery slope once you start going up it." Two pastors and other individuals who live in the Short Mountain area spoke against Harvey's request, which failed to even get a motion before the Commission. During the Old Business section of the agenda, Bush brought up a previous topic: The sale of beer on Sunday with the proceeds going to ball parks for Cannon County's youngsters. "Sunday beer sales are allowed all around us. This will help them get their ball parks in order," Bush said. "It's not wise to move on it now," said County Executive Gannon. Bush moved to allow Sunday beer sales. James Holloway seconded. Voting "Yes" were Jim Bush, James Holloway and Brent Bush. Voting "No" were Mark Barker, Karen Ashford, Glenn Steakley, Richie Hunter and Adam Melton. Selected Woodbury Police Chief Kevin Mooneyham for the 911 Board. Authorized $15,000 for furnishings for the new ambulance center. Announced budget hearings will begin April 7.